Rising Damp is caused by moisture containing natural formed salts rising from the ground through capillary action. Salts and minerals in the ground are normally harmless. However, when combined with water, these salts dissolve and become acidic substances. Rising Damp is usually evident in the form of stained walls, blistering and peeling paintwork and salt accumulation of up to one metre high. Rising damp if left untreated will cause serious damage to the building's structural integrity, not to mention damage to timber work i.e. flooring, architraves and skirting boards. As a health issue, Rising Damp can be detrimental to people suffering from asthma or any other breathing disorders. A qualified Damprid Technician will carry out a thorough inspection using a digital moisture detector. Our Technician will determine by the metre reading if the dampness is caused from rising or penetrating/lateral damp. A detailed quote will then be forwarded to the owner outlining the recommended work/s to be carried out including specifications and costs involving the rectification of your damp problem. 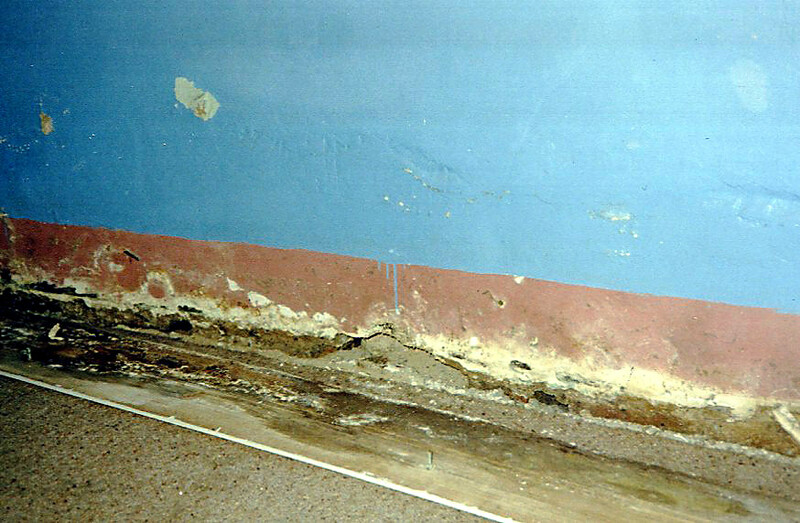 The effects of Rising Damp - resulting in damaged walls and timber work.